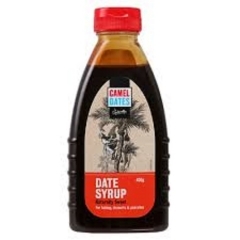 Home > Middle Eastern > Camel Dates Date Syrup. 400gm. Dates are healthier than syrups and non refined sugars, use them to make smoothies or oatmeal. 1. Drizzle it on pancakes or French toast. 3. Pour a few tablespoons over root vegetables such as butternut squash, sweet potatoes, carrots and parsnips along with some olive oil, fresh thyme and salt and pepper before whacking them in the oven and roasting them. The date syrup accentuates the natural sweetness of the vegetables perfectly. 7. Use it as a marinade for chicken. You know that lovely, sticky, sweet glaze you can get on BBQ chicken? 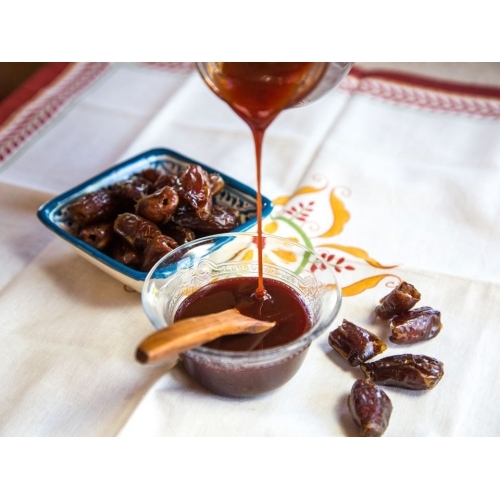 Try combining date syrup with some soya sauce, olive oil, crushed garlic, lemon juice and salt and pepper and marinading some chicken legs in that sauce for an hour. Then roast in the oven till the chicken juices run clear and the chicken skin is crispy. 8. If you make your own granola try using date syrup instead of sugar, honey or golden syrup to give the oats a caramel crunch and a treacly flavour. 10. Spoon it into home-made hot chocolate. Frothy milk, good quality cacao, date syrup. This just works. Trust me.